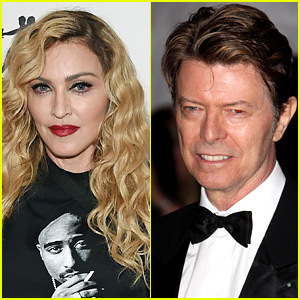 Madonna has taken to her Twitter account to share an emotional tribute for the late David Bowie after he died at age 69 this weekend. “Im Devastated! This great Artist changed my life! First concert i ever saw in Detroit! R.IP. ❤️ #rebelheart,” the 56-year-old entertainer wrote. “Talented . Unique. Genius. Game Changer. The Man who Fell to Earth. Your Spirit Lives on Forever! 🙏🏻❤️ #rebelheart,” Madonna added. “So lucky to have met you!!!! Hot Tramp I love you So! ❤️ #rebelheart,” she wrote in her final tweet. David died on Sunday (January 10) after a secret 18-month long battle with cancer. Jurnee Smollett-Bell Teams Up With 'Underground' Cast At Emmy Event! Happy Short Girl Appreciation Day! Celebrate With These Most Pint-Sized Female Celebs! 2016 TV Couples March Madness Challenge: Vote in the Final 4! Khloe Kardashian Feud: Is Khloe Fighting With Lamar Odom's Ex At The Hospital?